Monogram incised at truncation of neck: AH (interlaced). Title incised lower left: ELEONORA DVSE. 1. Family of the sculptor. 2. Shepherd Gallery, New York. 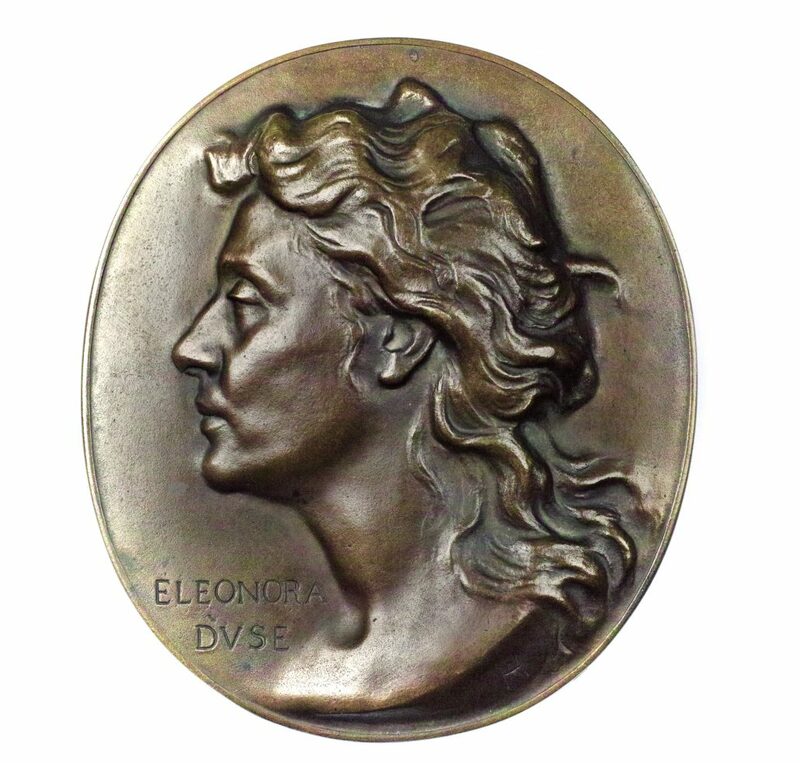 Hildebrand executed his portrait of Eleonora Duse (1859-1924), rival of Sarah Bernhardt, muse and mistress of Arrigo Boito and Gabriele d’Annunzio, circa 1910. The sculptor was residing in Florence. He had long admired the famous actress, and he finally met her through a mutual friend, the banker Robert von Mendelsohn (who collected Hildebrand’s work and for whose garden the sculptor had designed a fountain). La Duse, the most famous Italian actress of her day, lived nearby Hildebrand’s studio (a disaffected monastery on the outskirts of the city.) Sittings were arranged between the two artists, and the present left profile, where the actress’s delicate features and her sumptuous tresses are sculpted in generous high relief, was the result. The inscription on the lower left, denoting the actress’s name, where the “U” of Duse is replaced by a “V”, link the sitter with Ancient Rome’s Classical grandeur. Shortly before the First World War, actress and sculptor met again. Hildebrand executed a second portrait, a frontal, high relief in terracotta, now in the Neue Galerie, Kassel. Further examples of Hildebrand’s portrait of Duse are held by the Staatliche Kunstsammlung, Dresden, and two original atelier plasters, from the sculptor’s estate, by the Bayerische Staatsgemäldesammlungen – Neue Pinakothek, Munich. A series of letters in Duse’s hand and addressed to Hildebrand are conserved by the Technische Universitätsbibliotek, Munich. Bibliography: Angela Hass, Adolf von Hildebrand, das plastische Portrait, Munich, 1984, cat. no. 182 b, p. 177, ill.